I’m working on my second book. This book is a much bigger project than my first one. It involves the Internet of Things, security, privacy, and your home. For now I’ll leave it at that. After about a year of starting my own company, work is steadily increasing which has been keeping me busy. There may be some blog post worthy insights here, but I don’t think I can add anything new apart from what’s written in the many business related books published each year. I now have a one year old daughter. She’s away with her Grandparents this weekend and I’m realizing how much I miss her. Even at one she has a distinct personality. She likes her keyboard and her stuffed baby Gnu. These two items probably say more about me than her. Packt Publishing occasionally asks me to review some books for them. The deal is: I get the book and in return I write a review. You’ll see these on my blog. You should know that I read a lot and I infrequently find a book that is not worth reading. As matter of example, I present to you my current library usage in the next bullet. Professional Android 4 Application Development – Reto Meier. Station Eleven – Emily St. John Mandel. The book of Inkscape — Dmitry Kirsanov. Android tips and tricks – Guy Hart-Davis. Black Code: Surveillance, Privacy, and the Dark Side of the Internet – Ronald J. Deibert. Consent of the networked: the world-wide struggle for Internet Freedom – Rebecca MacKinnon. The Book of Wireless – John Ross. The Shallows: What the Internet is Doing to our Brains – Nicholas Carr. Arduino Workshop – John Boxall. Make: AVR Programming – Elliot Williams. Use your library. It’s an important resource. Make a reading list. People like lists. Somebody has my book checked-out. This makes me happy. I like physical books and I’m increasing bothered by eBooks. LibraryThing is a good website to organize your books. Here’s my library. I’m trying to get a workable version of an Arduino library out to work with Atmel’s crypto devices. It’s on GitHub. These are a set of good heavy-duty bookends. This is an excellent commuter mug. I would like to receive over-the-air HDTV. However, I continue to fail to make this work because the reception indoors is very bad. I spent a day a few weekends ago on my roof playing with an antenna. I failed. There was a company that had a clever idea: capture the over-the-air signal and push it out over the Internet. The U.S. Supreme Court passed a ruling that makes this a legal gray-area. This would have been a nice solution to my problems because I don’t want to pay $100 a month for cable TV. I’ve been enjoying Kona coffee lately. It’s probably some mass-produced brand that puts a Kona label on the bag but it makes me think of Hawaii. However, Kona coffee is routinely pretty good. I’ve left the Mac world and I now use System76 hardware with Ubnuntu (but Gnome Shell). I’m very glad I switched. Victory at Sea is a fun game. They did an especially good job with the submarine combat. Neal Stephenson has a new book coming out. You can pre-order a signed copy from Barnes & Noble. This will be my second signed Neal Stephenson book. The first was Reamde which says, “Josh, thanks for your service, Neal.” That’s pretty cool. I made a friend go get it signed for me while I was deployed. He is a good friend. Hopefully soon, SparkFun will release another collaborative project that we’ve been working on. I originally saw white and gold, but then switched to blue and gold. I’m increasingly of the opinion that IRC is the best social media network ever created. deadmau5’s while (1<2) album is pretty good. This is my desk. I need to clean it. 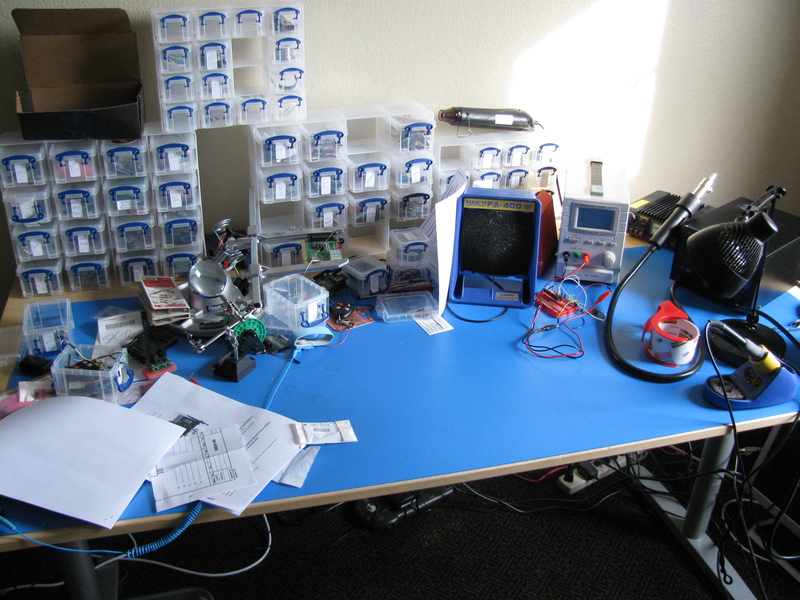 In your work desk photo, just curious if you remember where you got those small component boxes/trays? They are the aptly named Really Useful Boxes. They are a bit pricey, but I found them on sale at Staples once. I working on a class with SparkFun regarding item #19 above. There will be some crypto-hardware involved 😉 Once the details are worked out I’ll post an update. 3) I cannot believe you own all of those physical books! 1.a. Glad to hear that. 2.a. I should have made this list in a planner and taken a picture of it ;). My current favorite notebooks are Zequenz classic 360 in graph paper. Ha! My one-year-old has already destroyed my Nexus 4 once. That kid’s keyboard is doing much better.